Gagan Khanna has done Bachelors in Designing from NIFT, New Delhi. He then did Bachelors in Business from S Manipal University followed by a Masters in Retail Strategy from Manchester Business School, London. He has done multiple certification courses in Retail Lighting, Dynamic, Multi-sensory Ambience for Customer Delight, Fundamentals of Project Management, Business Finance & Strategy. 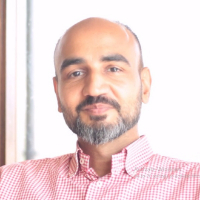 He has worked on various projects in Market Research, Store Design, Sourcing, Conferences, Exhibitions, Formulation & Documentation of Best Practices, Visual Audits and Training for companies like Airtel, Vodafone, Motorola, Shoppers Stop, Meena Bazar Group, Disney Perfumes, Barista, Vasari, Titan Industries, Landmark Group. Projects included Product Design, Fixture Design, Show Window Design, Visual Merchandising, Theme Promotions, Project Management, Events, Exhibitions, Space Planning and Corporate Training. He is the founder of DesignSteps Creative Academy which focuses on training the designers. "I have done Bachelors in Designing from NIFT New Delhi and then did Bachelors in Business from S Manipal University followed by a Masters in Retail Strategy from Manchester Business School, London. I have done multiple certification courses in Retail Lighting, Dynamic, Multi-sensory Ambience for Customer Delight, Fundamentals of Project Management, Business Finance & Strategy. I have worked on various projects in Market Research, Store Design, Sourcing, Conferences, Exhibitions, Formulation & Documentation of Best Practices, Visual Audits and Training for companies like Airtel, Vodafone, Motorola, Shoppers Stop, Meena Bazar Group, Disney Perfumes, Barista, Vasari, Titan Industries, Landmark Group. Projects included Product Design, Fixture Design, Show Window Design, Visual Merchandising, Theme Promotions, Project Management, Events, Exhibitions, Space Planning and Corporate Training. I am the founder of DesignSteps Creative Academy which focuses on training the designers." Customer journey is the complete sum of expressions that a customer goes through when interacting with a business. It's used for understanding and addressing customer needs and pain points. Customer Journey is the complete sum of experiences that a customer goes through when interacting with a buisness.It's used for understanding and addressing customer needs and pain points. "I have done Bachelors in Designing from NIFT, New Delhi. I then did Bachelors in Business from S Manipal University followed by a Masters in Retail Strategy from Manchester Business School, London. I have done multiple certification courses in Retail Lighting, Dynamic, Multi-sensory Ambience for Customer Delight, Fundamentals of Project Management, Business Finance & Strategy. I have worked on various projects in Market Research, Store Design, Sourcing, Conferences, Exhibitions, Formulation & Documentation of Best Practices, Visual Audits and Training for companies like Airtel, Vodafone, Motorola, Shoppers Stop, Meena Bazar Group, Disney Perfumes, Barista, Vasari, Titan Industries, Landmark Group. Projects included Product Design, Fixture Design, Show Window Design, Visual Merchandising, Theme Promotions, Project Management, Events, Exhibitions, Space Planning and Corporate Training. I am the founder of DesignSteps Creative Academy which focuses on training the designers."